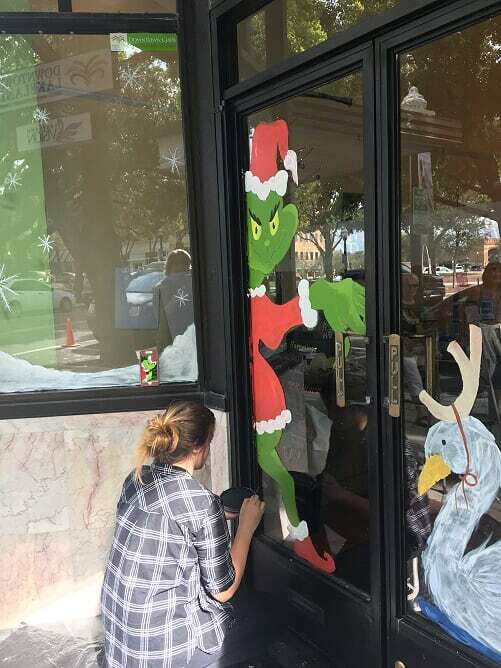 Tenoroc High students are helping downtown Lakeland get dressed up for the holidays. 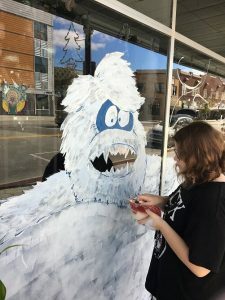 A team of student artists spent Thanksgiving break hand painting wintry scenes on the windows of several businesses and organizations. 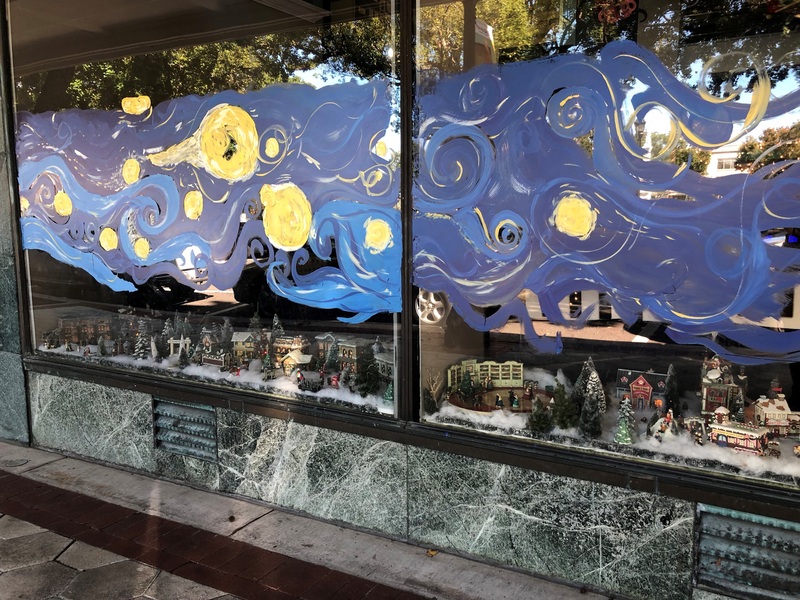 At Explorations V Children’s Museum, they created a “Starry Night”–inspired sky above the miniature buildings of a Christmas village display. An abominable snowman adorns the glass at Lloyds of Lakeland. Swan Brewing patrons are welcomed by a festive scene declaring “It’s the most swanderful time of year.” Meanwhile, the Grinch himself lurks behind the door at the Lakeland Downtown Development Authority (LDDA), perhaps waiting for a chance to steal Christmas. The informal exhibition is the result of a new project launched by the LDDA with Tenoroc High visual arts instructor Sherry Ross. 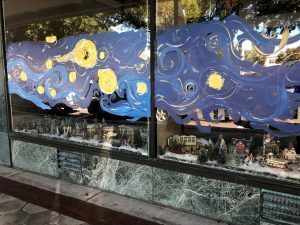 Julie Townsend, the LDDA’s executive director, said the artwork helps create an inviting atmosphere for residents and holiday visitors, who will get a chance to vote on their favorite window paintings through a contest beginning Dec. 1 (details will be available at each merchant location). 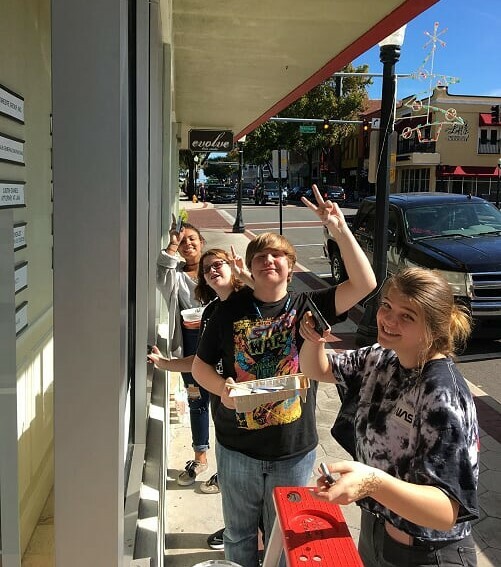 The Tenoroc High students are earning community service hours as they volunteer their talents, and Townsend notes they also are learning the potential value of their work, since many downtown businesses spend hundreds of dollars each year to have their windows painted by professionals. Townsend said she wants to continue the effort on an annual basis with students from Tenoroc and other schools. Tenoroc High’s Sherry Ross says the experience has been a valuable one for her students. “This is a wonderful thing, because we’ve never done painting on windows before,” she said. The core group of Tenoroc artists — Victoria Bakeeff, Leilah McCargo, Krysta Smith, Jonathan Willis — first tested their skills by painting on windows at school. With supplies and a list of businesses provided by the LDDA, the students then spent the week of Thanksgiving break tackling a diverse array of storefronts downtown. Along the way, Ross taught her students how to take visual cues from each business and use that to tailor their work and pitch their services to future clients. There is still much to be done. Over the next week or so, Ross will be enlisting additional student artists from Tenoroc to paint windows at more locations downtown, including Keller Williams Realty, Mojo Federal Swine & Spirits and Nathan’s Men’s Store, among others. Ross noted that one student has already lined up a gig to paint the windows at a local Wendy’s. Note: Want to help support student artists? Come to Tenoroc High’s annual Winter Fest on Saturday, Dec. 8 from 10 a.m. to 2 p.m. and pick up some art and crafts made by students from our schools!